About the time I was first getting seriously interested in early American history, my parents and I took a trip to Colonial Williamsburg. We planned to visit Carter’s Grove, the plantation home of Carter Burwell (and before that, site of a seventeenth-century English settlement excavated by famed archaeologist Ivor Noel Hume), but it was only open on certain days of the week and we got our schedule mixed up, so we missed it. CW sold the property five years ago. Now it’s falling apart, because Halsey Minor, the tech investor who bought the place, has evidently overextended himself and can’t afford to keep it up. Inspectors from the Virginia Department of Historic Resources have been monitoring the property and have noted in reports the continuing deterioration of the mansion. “Very little general maintenance work has been conducted,” inspectors said in a March report to the court after a visit to the mansion earlier this year. The inspectors found water leaks and worsening signs of rotting, cracking and mold throughout the mansion. It was unclear, they said, whether recent repairs actually stopped the water intrusion. [A court-appointed trustee] discovered that the insurance on the property had lapsed, the property’s caretakers had not been paid in a month, and that utility companies were threatening to shut off the gas, electric and water services for lack of payment. The Carter’s Grove bank account had only a few dollars left. Pretty sorry outcome for one of the most significant pieces of architecture in the country. Lately I’d been having some trouble logging into my work e-mail, and when I called the tech guys they discovered that in the process of some changes to the system my entire account had accidentally been deleted. They were able to set up a new one for me, but all my old messages, both incoming and outgoing, vanished into whatever ethereal realm is reserved for defunct e-mail accounts. It’s no great loss as far as posterity is concerned, since most of these e-mails dealt with mundane matters—students apologizing for missed classes, reminders that I needed to submit paperwork, and so on. But it got me thinking about a question that I ponder from time to time. What is the advent of electronic communication going to mean historians of the future who will be trying to study us? For some scholars, it probably won’t mean much at all. Modern bureaucracies still generate reams of paperwork. As organizations both public and private have grown and become more complex in the last 130 years or so, they’ve churned out mountains of internal documentation. When historians write about the presidencies of Bush and Obama a century from now, they’ll have plenty of written evidence to handle. Many organizations archive the documents they generate electronically; some of them, in fact, are required by law to do so. The difference, I think, will involve unofficial, personal communication. For biographers, personal letters are an indispensable tool. Even historians writing about public events rely on personal documentation to gather information. My own graduate research about King’s Mountain involved reading a lot of personal letters. Until comparatively recently, it wasn’t uncommon for ordinary people to leave behind a cache of letters and other personal papers. But what about now? Speaking for myself, I’ve sent and received plenty of personal e-mails, but as for hard copies, I’ve got nothing but birthday cards and the occasional cover letter. Since personal e-mail accounts are hidden behind passwords and subject to deletion, will historians of the future will be able to access the correspondence of ordinary folks like you and I? Of course, hard copies aren’t immune to time, either. The great Tennessee historian J.G.M. Ramsey accumulated a treasure trove of documents about the eighteenth-century frontier, some of which he used to prepare his massive book on the Volunteer State’s early days. Unfortunately for future students of Tennessee history, Ramsey was an ardent Confederate, so when a Unionist firebrand torched his home, his remarkable archive went up in smoke. One advantage of electronic documents is that they’re easy to back up. Some folks in Cleveland, TN have commissioned a portrait of the town’s namesake, Revolutionary War hero Benjamin Cleveland of North Carolina. Don Troiani will be doing the painting. The 300-lb. Cleveland commanded the Wilkes County militia at King’s Mountain and persecuted backcountry Tories with a zeal bordering on fanaticism. As far as I know, there aren’t any contemporary likenesses of him, so this will be the first attempt at an accurate depiction. Speaking of the Carolinas, renowned Palmetto State historian Walter Edgar is retiring. He’s a guy who takes public history as seriously as he takes scholarship, so here’s hoping he keeps writing and speaking. For years, varied and sometimes wild claims have been made about the origins of a group of dark-skinned Appalachian residents once known derisively as the Melungeons. Some speculated they were descended from Portuguese explorers, or perhaps from Turkish slaves or Gypsies. Now a new DNA study in the Journal of Genetic Genealogy attempts to separate truth from oral tradition and wishful thinking. The study found the truth to be somewhat less exotic: Genetic evidence shows that the families historically called Melungeons are the offspring of sub-Saharan African men and white women of northern or central European origin. And that report, which was published in April in the peer-reviewed journal, doesn’t sit comfortably with some people who claim Melungeon ancestry. Most of the stuff I’ve read linked the Melungeons to some type of Portuguese or eastern Mediterranean ancestry. This latest study focused on families in upper East Tennessee, so it’ll be interesting to see if they extend it to other areas. It’s a source of both surprise and amusement to me that the post on the Bat Creek Stone continues to get passionate comments almost two years after it went up. Whenever I glance at the search terms that bring people to the blog, “Bat Creek Stone” is invariably near the top of the list. I can understand that, since it’s a pretty obscure topic and thus there are only so many places on the Interwebs a Google search will take you. But the fact that people continue to post replies is unusual, since this blog gets very modest traffic and it’s rare for any of my posts to generate more than a few comments. I’m also surprised at the diversity of these reactions. Some people take issue with specific points, while others just seem irate that I was critical of Glenn Beck. Some readers want to use the post as an opportunity to make a case for pre-Columbian contact in general, or for the validity of Mormonism. I’m not qualified to make a case for or against the Bat Creek Stone. I’m neither an archaeologist nor a linguist. But I have a real problem with a public figure like Beck taking it upon himself to educate his audience about the past and making such a mess of it. Getting one’s facts straight is the first responsibility of the public historian. When it comes to the Bat Creek Stone, it simply won’t do to present it as an undisputed artifact. That’s what Beck did. I’m not complaining about the reaction the post has gotten, mind you. Far from it. I wish readers would pitch in like this all the time. I just think it’s interesting that of all the subjects we toss around here, this is the one people want to discuss the most. As I continue trying to catch up on my reading backlog, I’ve just finished Benedict Arnold’s Army: The 1775 American Invasion of Canada During the Revolutionary Warby Arthur S. Lefkowitz. It’s a fine campaign study, thoroughly researched and compellingly written. I’d recommend it to anybody interested in the Revolution. Arnold’s march across the Maine wilderness is the sort of stuff of which legends are made, as is the dramatic nighttime assault he and Richard Montgomery launched against Quebec. 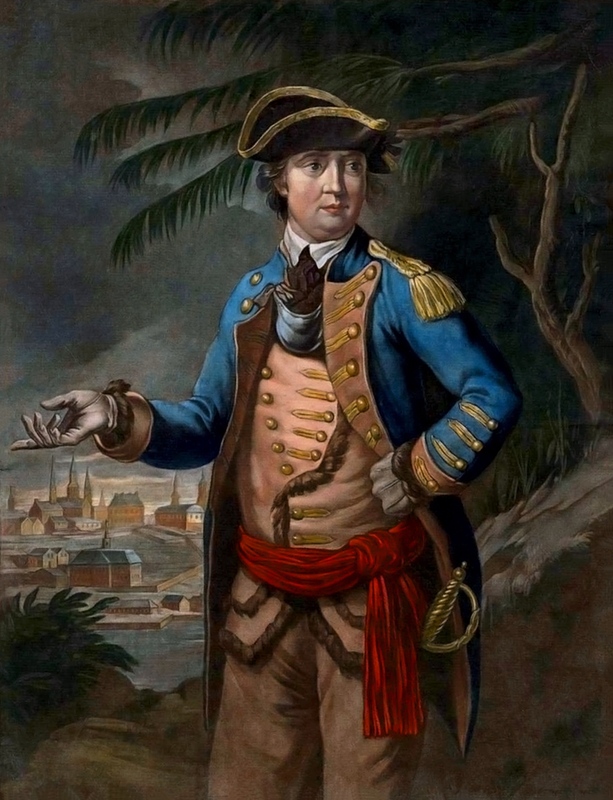 The failed attack cost Montgomery his life and Arnold a wound in the leg—his first leg wound, actually, since he caught another one at Saratoga. The Quebec expedition is not one of the Revolution’s better known incidents, which is a shame and also a little odd. After all, the march was much longer and far more arduous than the Overmountain Men’s 1780 expedition to defeat Ferguson, as well as Washington’s retreat across New Jersey in late 1776. Its relative obscurity alongside other Revolutionary episodes may have something to do with the fact that the attack on Quebec didn’t succeed, but I can’t help but wonder whether Arnold’s eventual treason might have something to do with it. He was a remarkably audacious and inspiring combat commander. When reports of his small army’s trek to Canada reached the Americans, they lauded him as a modern Hannibal; five years later, they were calling him an American Judas. Had his Saratoga wound been fatal, he probably would’ve joined Montgomery and Daniel Morgan in the pantheon of Revolutionary heroes. A news item out of Georgia. I’m never happy to see potentially significant ground torn up, but one can’t help but be impressed by this developer’s honesty. Representatives for Weisbaden told city officials and residents at Monday’s meeting Jonesboro is a sensible place for a new funeral home because of its aging population. Hey, all you elderly folks in Jonesboro—the people at Weisbaden Investments have big plans for you!